Charles Conder established his reputation as a young artist of note in Sydney by the late 1880s through this exceptional ability to capture in his work the poetic expanse of the city's atmosphere - from the dazzling light of Sydney's sun-filled beaches, as well as the colours and melancholic mood of its wet weather days. On a wet Saint Valentine's day in 1888, the lush colours of the Chinese market gardens of what was then Randwick, caught Conder's attention. He beautifully conveyed both the palette and mood of the rainy day on the back of cedar cigar box, creating one of the most distinct works of his Sydney experimental oeuvre. 'Rainy day' is composed with a palette of evocative greens which are grounded by the dark brown reds of shrubbery, highlighted by the bright blue garments of workers in the gardens, and set against a pink-infused cloudy grey sky. An intensely rich and poetic orchestration of colour, this small experimental work has a wonderful sense of immediacy, perhaps more than any other of Conder's panel paintings produced at this time. The subject of 'Rainy day' is unusual in late 19th century Australian art. 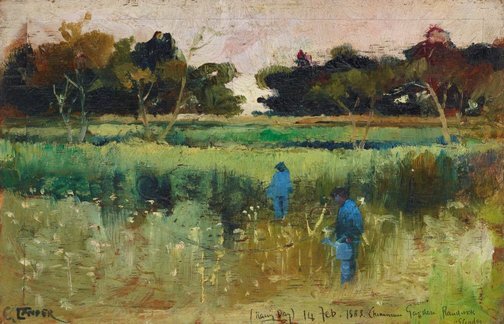 The depiction of Chinese immigrants workers, certainly within the poetic terms of Conder's depiction, is possibly unprecedented. Rather than inscribing the usual sense of 'exoticism of the Orient', or the blatant racism that recur in paintings of Chinese Australians at this time, 'Rainy day' is instead a elegiac evocation of place, a mood that is furthered by the presence of the figures who are shown as being at one with the landscape. The Chinese growers gardens remain today in what is now La Perouse, imbuing the work, whose subject is of historical note, with an unexpected sense of continuity with the present. Signed l.l., black oil "C. Conder". Not dated. Signed and dated, l.r. black oil "... 14 Feb. 1888. .../ C. E. Conder". Our art critic, The Sydney Morning Herald , 'Spring art show', pg. 4, Sydney, 24 Sep 1946, 4. Look , Sydney, May 2018-Jun 2018, 16 (colour illus. ).